City living is pretty sweet most of the time. There's always something to do, and when you need to let your hair down after a long hard day at the office you have your pick of where to eat and which bars to go to. But it's not all fun and games, with our fast paced and busy lifestyle it's easy to let stress and anxiety creep up on you. 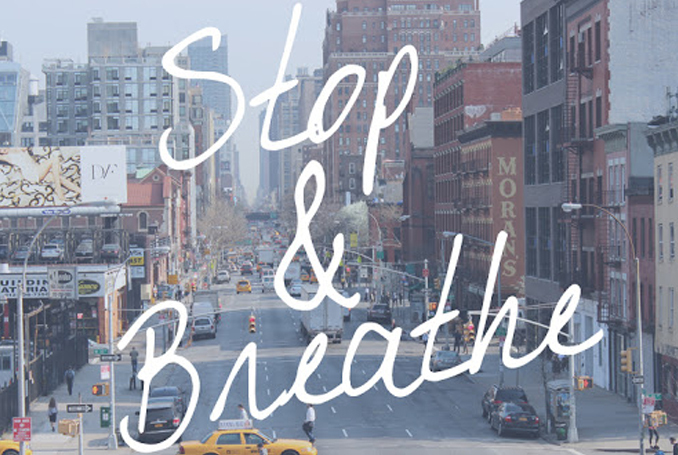 So, in today's blog post we have listened to the experts top tips to reduce stress. We all remember coming back home after a stressful day at school and scribbling into our diaries. This isn't just for teenagers, it's a great way to look at what causes your stress and anxiety and helps you deal with the issues head on. So grab a notebook and get writing. WebMD recommends writing for 10-15 minutes every evening about your day and how stressful events made you feel. Alternatively tracking your stress throughout the day can help you realise what the triggers are and better ways to cope. Experts advise taking a 10 minute break to step away from your desk and get much needed vitamin D into your body. As we've heard time and time again, exercise is the best way to reduce stress and helps with mental fatigue boosting cognitive functioning. A break from your desk can help calm down anxiety, but better still, experts believe that finding a green space to completely switch off will help you find your zen. According to a report in the New York Times a walk through a green space is "effortless" and allows us to reach an involuntary attention, "it holds our attention while at the same time allowing scope for reflection" study researcher Jenny Roe told the NY Times. Obviously there is a little more involved than simply breathing, but there is a lot that can be gained by following this calming technique. The great thing about using breathing techniques to relax is that it can be done anywhere; sitting, standing, at home or in the office. It's a great way to calm yourself in a stressful situation before you let everything get on-top of you. Yoga classes are also a great way to learn breathing and relaxation techniques, which you can easily practice at home, on the beach or in the park! There are some yoga positions that are more effective on stress and calming tension, The Huffington Post has a great article on the top 10 poses for stress relief which are worth taking 10 minutes out of your day for. For those crafters out there I'm sure you already know the benefits of crafting, but for those of you who don't, hobbies such as knitting or needlework are a great form of concentration and relaxation. The repetitive motions especially, are a great way to soothe any anxiety you may be feeling. A study for the British Journal of Occupational Therapy found that "The results show a significant relationship between knitting frequency and feeling calm and happy. More frequent knitters also reported higher cognitive functioning." If you hadn't already noticed (where have you been!) there has also been an explosion in the adult colouring-in book market. A lovely, soothing, meditative and creative hobby, adult colouring-in books have come a long way from the childhood versions you remember. These books come filled with intricate designs and inspirational messages ready to focus your mind and in the process help you to de-stress. Now I realise we can't all afford to go out to a spa stay every weekend but we can all get the spa glow at home. OK so it's no luxury getaway, but it's still an easy way to take some time for yourself and stick to your budget. Pick a day with no interruptions, grab your favourite intensive hair conditioner, a natural face mask, some bath salts with essential oils, a natural body scrub and a natural body balm. Light a couple of soothing scented soy candles to set the scene and you have your very own relaxing home spa experience. Whether you're working out at the gym or sitting at the desk all day, warm baths are great relievers for tension headaches and muscle elasticity. Natural bath salts are a much better choice to chemical laden bubble baths. Bath salts contain a large number of minerals including magnesium which helps fight stress and combat fatigue, potassium helps balance the moisture levels in our skin, bromide soothes sore muscles and sodium plays a roll in balancing lymphatic fluid in our bodies. In the midst of a busy lifestyle, it can sometimes be taken for granted, but time out with your best friend is a great stress reliever. Talking through your problems with your best friend helps you put things into perspective and can help make situations easier to deal with. Allowing you to relax and often have a good laugh in the process.